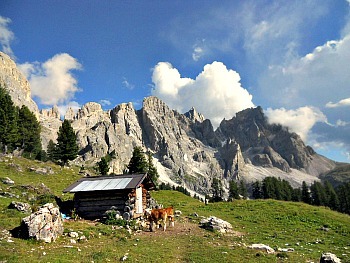 The Pale San Martino and San Lucano: Among the Most Magical Dolomite Mountains. 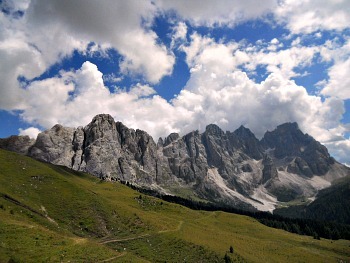 The Pale San Martino (‘Pale di San Martino’ in Italian), San Lucano, Vette Feltrine and Dolomiti Bellunesi form a system that is one of the nine areas protected within the Dolomites UNESCO World Heritage Site (see an image of the Pale San Martino above, taken from their 'back' side at Passo Valles). This system covers an extensive area, which includes several spectacular mountain groups. Douglas William Freshfield – one of the Englishmen who pioneered mountaineering in the area – thus spoke of the Pale San Martino in 1875 (in 'The Italian Alps'): «For this country owes its wonderful beauty in great part to the constantly recurring contrast between the tall bare cliffs of the green hills which like a sea roll their verdant waves between them. Round the peaks lies a region of wide-spreading downs, scarcely divided from each other by low grassy ridges; of forest-clad valleys where the rich soil nurtures a dense undergrowth of ferns and moisture-loving plants. The huge crests of the Sass Maòr or the Cimon della Pala never look so wonderful as when, seen from among the Rhododendrons and between the dark spires of pine-woods, their rosy heights come out about lawns». 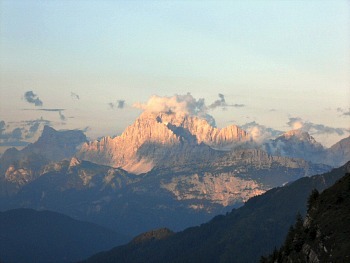 From south to north, one can distinguish the Vette Feltrine, the Cimonega-Erera-Brandol group, the Monti del Sole (‘Mountains of the Sun’), the Schiara-Tàlvena, the Civetta (see an image of the Civetta, also taken from Passo Valles, above) and Moiazza group, and, finally, the Pale San Martino and San Lucano proper. In decreasing order, the highest elevation within this system is Cima Civetta (‘the Owl’) at 3,220 m, followed by Cima Vezzana (3,192 m), Cimon della Pala (3,129 m) and the Pala di San Martino (2,982 m). 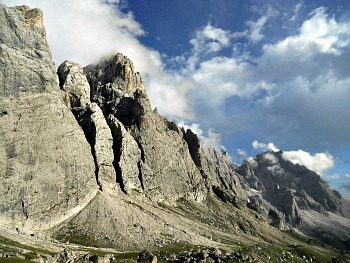 Other notable peaks include Cima della Fradusta (2,939 m) and Monte Agnér (2,872 m) – towering above Agordo. Further south (near Belluno), the Schiara (2,565 m) and Tàlvena (2,542 m) are less elevated. This territory is characterized by a varied landscape: rock faces, grassland and Alpine meadows set the scene. Tumbling streams and tranquil small lakes and pools abound, with the more localised presence of relic glaciers and precious peat-bogs. The reasons for this variety have to be searched for in the geologic structure of the area, made up of different types of rock. Emblematic, in this respect, are the imposing walls of the Schiara and the Civetta, which recount – layer after layer – the passage from the Triassic to the Jurassic and the fragmentation of the great tidal plain of Dolomite bedrock. The southern section of the range has a wealth of nature reserves and unspoiled landscapes, and it is mainly covered by two protected areas (a National Park – the Dolomiti Bellunesi – and a Natural Park, the Paneveggio-Pale di San Martino). Both parks contain semi-natural landscapes that are sometimes rugged and quite difficult to access; deeply-cut valleys and gorges among impressive near-vertical cliffs are also notable features. In the northern section the landscape becomes more broken and articulated, and the shape of the mountain range is linked to the presence of one of the largest and most intact fossil rock-cliffs from the Triassic age: the Northern flank of Civetta (also visible in the picture above). This is an impressive rock wall that precipitates for almost a sheer 1,000 m, fragmented at the top in a fantastic swarm of innumerable towers and pinnacles. From Coldai to Pelsa, via the Agner, Pale di San Lucano and Pale San Martino proper, this is also where one can literally walk over the atolls of an ancient lagoon that rose up for about 1,000 metres above the sea-bed. All in all, the incredibly stratified northern wall of Civetta offers an extraordinary geological evidence of the upheaval that generated the Dolomites in the first place. Magnificent displays of color are present too – especially so in the valleys of Garès and San Lucano: these are the result of the contrast between the dark rocks of volcanic origin that rest on top of the white cliffs of the former atoll. Above the massive reefs of the ancient lagoon – now turned into plateaus – other piles of rock rise, forming new mountains that tell another chapter of a very complicated geological history. The tightly layered face of Civetta mentioned above – broken up into innumerable needles and pinnacles – testifies to the extraordinary geological upheaval that these peaks went through in order to be generated. One can only fathom the considerable importance of these mountains for geology by considering the exceptional variety of phenomena that are here represented. To the south, evidence is illustated of the ‘recent’ history from the Upper Triassic through to the Cretaceous period, documenting the events that led the Dolomites to sink deep into an open sea; to the north, yet another history of reefs and volcanoes is being revealed instead, and dominates the landscape. 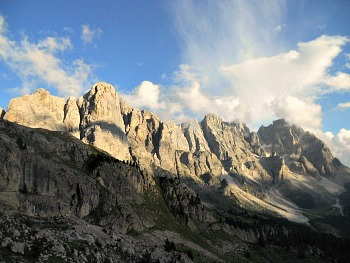 A unique location – in terms of its altitude and dimension – is the Fradusta plateau, on the Pale San Martino, which represents an original surface of a former Dolomite reef, laid bare by erosion. In fact, these are all rock formations that were exposed by the erosive activity triggered by more recent geological events. Within this system, the geo-morphologic features are particularly significant, including various karstic and glacio-karstic phenomena – an activity which reveals itself through various superficial (epigean) and subterranean (hypogean) forms. The modelling caused by ice also makes itself noticeable through a series of mainly late glacial moraine deposits from the last glaciations, while water erosion is expressed by impressive, deeply-cut gorges and ravines. South of the main Dolomite massifs lies a stretch of open country that divides into two contrasting areas: Panevéggio – a huge area of primeval forest – and the Pale San Martino proper, displaying some of the Dolomites’ wildest and most dramatic mountains. Most of Panevéggio’s 2,700 ha of forest is an unspoilt wilderness of larch, silver fir, Arolla pine, Dwarf Mountain pine and Norway spruce. From this solemn wooden expanse came some of the timber for the Venetian fleet of the 17th century, and also the wood that Stradivarius and his fellow craftsmen made into violins in the workshops of Cremona. The resonance of these straight natural poles is still renowned far and wide, but nowadays there are different pressures and challenges to the forest. Fortunately, commercial logging demand here has been relieved by separate, dedicated plantations; all in all, less than 4% of the total area of the forest is given over to cultivated woodland and roads. The Panevéggio area contains relatively modest mountains, when compared with the peaks to the north, but it has an abundance of streams and waterfalls instead. Away to the west, stretch the granite ridges of the Lagorai – an immense area of wilderness generally overlooked by the hordes of Dolomite trekkers directed into the Dolomites’ heartland. Paths and bridleways are ideal for walking; especially appealing are the trails around Prati di Tognola (see Vanoi), where as a constant backdrop to the forest walks are fantastic views of the jagged peaks of the Pale. Distinct from neighbouring groups, the Pale San Martino boast two minor glaciers – Travignolo and Fradusta – while the upper ridges, moraines and karstic plateaux are all but a barren land. So pallid is the rock here to justify completely the apt name of ‘Monti Pallidi’ given to the Dolomites: these rocks glow even at the first light of dawn! Hiking itineraries vary greatly in degree of difficulty; although all paths are well-marked, some are extremely challenging, with much scrambling and the occasional ‘via ferrata’ (iron-way). It goes without saying that these latter should only be approached by the experienced mountaineer, and with the proper equipment. A little to the south of the main summits of Vezzana (3,192 m) and the Cimon della Pala (3,184 m) lies the val Canali – a more intimate and undemanding area (see Panevéggio). Reached from the historic mining district of Primiero – which gravitates on to Feltre – this little-frequented valley embraces the peaks of Sass Maòr (2,812 m) and Cima d’Oltro. As for the flora, the pastures of the Pale San Martino contain many of the classic Alpine species; among the rarities found in these mountains are the lilac-flowered Tyrolean Primrose (Primula tyolensis), which is endemic to the Dolomites. Other species may be relatively more common, but they still provide beautiful sights nonetheless – such as, for instance, Devil’s Claw (Physoplexis comosa), with striking purple blooms: a flower which is usually restricted to limestone and Dolomite rock crevices. The "Passo Valles Geological Trail"
This geological trail proposes a dive in a sea 250 million years old, to then gradually float towards the surface of the landscape as it appears today, representing the events of the last glacial era. When we walk amongst these magnificent mountains we need to know where to lay our gaze; what to look for; how to understand the rocks, the formations, the geo-morphological phenomena that we discover as, when walking, we are also progressing through time. The intent here is to guide the visitor in as light a way as possible, keeping at the same time the guard up, in order not to get lost in the sea of geological time. 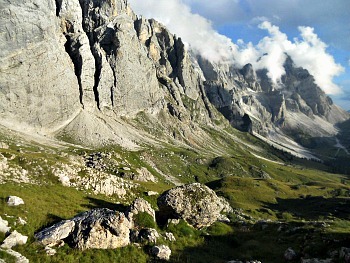 The circular trail proposed from Passo Valles to the pastoral Val Venegia valley head (pictured above) – and return – is the first of its kind proposed by the Panevéggio park in order to explore and comprehend the geo-morphology of its territory. As we embark on the trail, the best advice is to perhaps try and forget about time, entering instead into a totally different dimension altogether – one that tries to capture time in another way; a time dedicated to the understanding of nature, which could be compressed in a instant: and this may well be the only thing to do, when confronted by the ungraspable notion of ‘timeless time’, which this geological trail challenges us to enter. Around 290-270 million years ago, following magmatic processes, the porphyry of the Adige Valley Volcanic Platform was deposited. After that, the eruptions stopped, and the erosion of the volcanoes gave origin to the sediments that formed the Val Gardena Sandstone. Then the sea advanced again, and where there was a strong evaporation the deposition of the Bellerophon Formation began, with the subsequent deposition of calcium sulphite (chalk). Repeatedly varying its ingressions inland, the sea then provoked the deposition of the different layers of the Werfen Formation, causing the creation of atolls similar to those we see today at the Maldives. This is witnessed by the Dolomite rock that went on to form the Pale San Martino. With the compression that gave birth to the Alps, the rise of the whole block that formed the Dolomites started, until its complete emersion around 20 million years ago – and this is how the Dolomites still look today. The path is organized in a series of eight stops, highlighting the most important stages in the development of this section of the Dolomites. We are at the beginning of a long history that starts in the Upper Permian (260-250 million years ago). Looking around us, we have to make an effort in order to see what would have seemed, then, like a sort of salt-flat: an arid low-lying area, with a hot and dry climate (areas known today as ‘sabkha’). The little water present, as it evaporated quickly, deposited nodules and white, thin layers of calcium sulphite (chalk), as well as the rock which we later came to call Dolomite. The soft rocks, white or yellow-grey, that can be seen at the beginning of the trail witness precisely that environment; calanque-like formations can also be admired in the Bellerophon Formation, as this is more easily prone to erosion. Characteristic folds can be noticed too, often brought to light after the erosion of softer and weaker layers. But time passed, and as it did so, a few million years afterwards came the sea; the nearby shore migrated, as it was subjected to marine regressions (this means that the shoreline retreated inland) and transgressions (the shoreline moved outbound, towards the open sea): thus started the Triassic (around 251 million years ago), with water waves subject to time and the depth of the sea. And this is how the Werfen Formation was created: a powerful succession of calcareous rocks, marl, silt and sandstone (see picture below). i) San Lucano member is not visible in this area. Very often in the valleys one may come across huge, interesting outcrops that were brought to light when water excavated and eroded the rocks – as in this case. One can observe the stratigraphic limit between two different members: the Campil member – more easily erodible, of a typical Burgundy-red color – and the Val Badia member, more compact and grey-coloured (see picture below). The two types of rock are alternated, and therefore this stratigraphic limit is known as ‘alternate’ (this fundamentally means that the two sedimentary formations repeatedly migrated over time; for example, in this location – during the Triassic – sometimes a shallow sea was established, which was followed by a new expansion of the sea inland; in this way, great depths and abysses returned – and so forth). At this point, millions of years have passed. Under the surface of the actual meadows and near the stream hide forms related to the last glaciations, dated to the Pleistocene – 10-15,000 years ago. For example, Malga Venegia is situated right above a debris-flow conoid: a range of disaggregated rocks that descended from the slope after repeated events of exceptional power, taking especially the form of floods that have produced over time a ‘cone’ at the valley base. This deposit is composed of angular rock fragments, but also mud – as there has been a mass transportation of material, and therefore no selection (this was a sudden movement of rock that did not allow for a granulometric selection, and therefore different materials can be found within it – such as large boulders, smaller pebbles, gravel, sand, all mixed together in an indistinct way). As we walk towards Malga Venegiotta, we find little and relatively low green humps instead: these are deposits of rock fragments, glacial lime (silt and sandstone) and blocks of metric dimension (they can be observed along the trail too), left over by the glacier along what must have been its right-hand margin. When met by restrictions, the debris-flow looks like the one that can be seen by the small bridge just before Malga Venegiotta: a deposit made of chaotic, gross rock detritus and a finer component, coloured by the variety of materials that compose it (like the Formations that can be observed on the way up, described above), product of landslides activated by water. 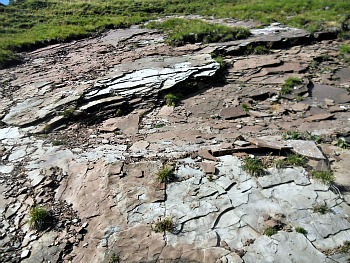 It resembles a proper torrent that flows into the Travignolo stream (if not channeled, the debris-flow tends to divagate, and over time conoids are formed at the base of screes; where the phenomenon is occurring more frequently actual streams are created too, as in the case of Malga Venegia; in the picture below, an impressive image of the debris-flow under the steep rock faces of the Pale San Martino). This is the domaine of rocks: half of the world under the heavens is made of rocks and of high grounds in general – peaks, needles, scree, passes and summits with a vertical appearance, which make one’s head spin when looked at. The Pale San Martino – as indeed all the Dolomites – are one day inevitably destined to crumble over the incredibly slow pace of geologic time, which cannot be perceived by the human eye over the course of a single lifetime. These mountains discharge and deposit at their foot ‘cones’ of detritic material; that is, the product of the association between gravity and erosion. At the foot of the Pale one can see several steep detritus’ conoids, composed of relatively uniform and spiky elements, with a decreasing granulometry towards the summit: these are the result of strictly gravitational processes. And one can also see yet more debris-flow conoids, less steep and with less spiky elements; these terminate with lobes that are witnessing subsequent events, and are crossed by ridged channels, which are the product of hydraulic-gravitational processes in coincidence with exceptional events. If the erosion is inclement for these beautiful mountains, at the same time it has the usefulness of unfolding and revealing evidence – as in this case – of the presence of a glacier: a glacial deposit ('till') was in fact brought to light here. It is constituted by a uniform mixture of materials that vary from big boulders to sand and lime. In this case, here one can only observe Dolomite – evidence of the fact that the glacier’s alimentation basin was local (on the Pale San Martino-Mulaz massif). As one rises in altitude one also goes back in time; obviously, the layers of sedimentary rocks are quite extensive and cover vast surface areas within the park. We find again the Werfen Formation with its ‘cover layer’ of the Campil member – a smooth and steep surface that tends to slide down. It is in fact a fossil sea-bed, over which the typical ripple marks left by prehistoric waves can still be observed. But why do we find all these things at such a high altitude? The collocation of these rocks – as well as those of all the main layers in the Cima Valles succession – document the Alpine orogenesis; that is, the formation of the Alpine chain. The Dolomites region found itself in a prevailing marine habitat until the end of the Cretaceous period (144 to 65 million years ago). During the Eocene-Oligocene (55 to 24 million years ago), folds and over-thrusts started to form, bending towards the south/south-west. The definitive emersion of the Dolomites happened with the Neo-Alpine or Alpine tectonic events dating back to the Miocene (24 to 5 million years ago), thanks to folds and over-thrusts that piled up towards the south. A last look towards the north, below the trail, allows us to observe the dolines (or 'sink-holes') over the grass surface: closed geo-morphologic shapes, which can be of different dimensions. These are produced over the chalks of the Bellerophon Formation by the action of meteoric rain that melted the rock slowly but progressively, filtering through without ever stagnating on the surface. These processes, in which the rock is being chemically dissolved by water, are called ‘karstic phenomena’ – or simply ‘karst’ (‘carsismo’ in Italian, from the Carso region near Trieste; in the picture below – taken from the same location as the one above – the focus is on the karstic features on the foreground). What Sort of Rocks Are These? The rocks that can be observed along the trail are all sedimentary. In general, one usually divides the sedimentary rocks in terrigenous and carbonate. The first type is formed after the erosion of a pre-existing substrate, deriving originally from diverse materials such as gravel, sand, lime and clay, whose parts have withstood transportation, accumulation, deposition and consolidation, eventually becoming ‘rocks’ in all respects (this process is known as ‘diagenesis’). The carbonate rocks are instead almost invariably of marine origin, and linked to the activity of organisms that formed husks or skeletons made of carbonate – like corals and algae. Such examples include limestone (calcium carbonate) and Dolomite (double calcium carbonate and magnesium). Sedimentary rocks are usually layered, but not always. Another type of sedimentary rocks are the evaporitic – like those visible at Stop 1 (in the Bellerophon Formation): these are formed where salts precipitate from concentrated solutions, due to strong evaporation of salt-water – as it still happens today in arid regions of the world; products of such activity include chalk and rock salts. Igneous rocks are formed by the cooling and consequent crystallization of magma; if this happens inside the terrestrial crust, one will have intrusive rocks as a result, while if it happens on the surface, the final product will be effusive rocks. In the intrusive rocks, minerals are well developed – as for instance in granite and gabbro – while in the effusive rocks they can be extremely minute (as in rhyolite and basalt). The igneous rocks are constituted mainly of quartz, feldspar (which contains silicon and aluminium), mica, amphiboles, pyrossenes and olivine (where iron and magnesium prevail). 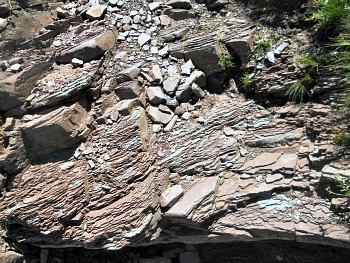 The metamorphic rocks have withstood several transformations, due to high temperatures and sustained pressure; they show a re-crystallization of the original minerals, the development of new mineralogical phases and a deformation such as to create folds and a dense exfoliation that causes them to flake off easily. Examples of metamorphic rocks include schist, phyllites, quartz derivates and marble. Why Are These Rocks Found Here? We know how certain rocks were created, as the same material and the same content is present in small organisms – albeit only in part – in the actual sediments. We know what comes out of a volcano, and we also know what is being deposited in the sea today; this demonstrates that there exist correlations between rocks scattered in different parts of the world. From this study, it was therefore inferred that millions of years ago the sea was found precisely in these areas, and that the African plaque pushed against the European plaque within the general ‘game’ of the so-called plaque’s tectonic. While the Alpine chain was being formed, this area was being uplifted thanks to the action of two opposing fault-lines, the Valsugana and Funes; in the end, the Dolomites completely emerged from the sea ‘only’ about 20 million years ago. The Dolomites’ region was uplifted as an entire block (‘pop-up’), and it underwent less intense deformations when compared to other areas around it. As these rocks were more plastic and subject to deformation, the chalks of the Bellerophon Formation were particularly twisted; as a result, spectacular folds formed in locations such as Punta Rolle (where very dramatic examples are still observable to this day – but this location, strictly speaking, is not along the geological trail). In general, the other formations have maintained more their original stratification, which is still recognizable today. Why Do These Rocks Have This Particular Aspect? In relatively recent epochs there were the famous glacial eras (10-15,000 years ago), which contributed a great deal in changing the landscape of mountainous regions – and also that of the surrounding plains: the big glaciers that were formed then created valleys, and deposited the material that they carried along with them – taken down from the slopes – in extended moraines and large plateaus. The ever present atmospheric agents further eroded, sculpted, carved and tirelessly polished everything they found along their way: this is why the Dolomites – with their pinnacles and needles – have the aspect that we can still admire today (as any other rock in other parts of the world, for that matter, but ever more so spectacularly here). What Is the Reason Behind 'Transgressions' and 'Regressions'? The continuous dynamic evolution of the sedimentary basins (in all the areas where there was accumulation of sediments) was responsible for the creation of these conditions. These were controlled by two main factors: the eustatic – or global – variations of the sea level, and the mobility of small lithospheric plaques. Their interactions are complex and would in fact require more explanations, but this is probably enough information as can be needed for going along the geological trail. If desired, more detailed information can always be found at the park's visitor centres; in any case – although it is provided here, albeit in a condensed form – it is worth pointing out that 'techincal' knowledge is not necessarily an indispensible factor for the enjoyment of these magical sceneries (in the final picture below, another beautiful image of the Pale San Martino at dusk).